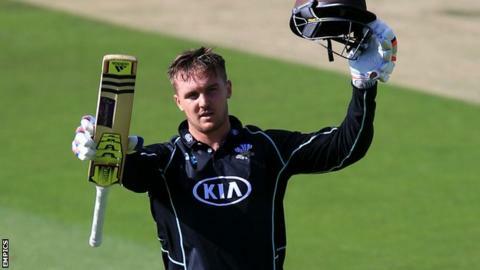 Surrey batsman Jason Roy has signed a new three-year deal with the club, keeping him at The Oval until the end of the 2018 campaign. The 25-year-old has scored over 1,400 runs in all competitions this year, including two centuries apiece in the Championship and the One-Day Cup. Roy also made his One Day International debut for England this summer. "This club is very much my home and this year has shown just what an incredible squad we have," he said. "Having guys like Alec Stewart and Graham Ford passing on their experience to us all is absolutely invaluable and I've got to thank them for everything they've done in developing my game. "I'm just now really looking forward to progressing over the next three years, both with Surrey and England, and hopefully I can achieve many more of my goals at both county and international cricket."